Most of the time, the motor gets too hot because of wrong combination of Motor Size/KV + Battery Cell + Propeller. Lots of people think they can use any propeller and battery they like for the same motor but this is totoally wrong. 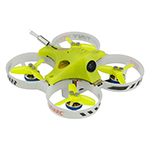 You should either use a smaller propeller or lower the battery cell or lower KV motor. For each propeller and battery combination you use, you should benchmark the motor to check the temperature. If it is too hot, that means you should not and cannot use this combination. There is no problem with the motor but usually people's thought. If your motor is not completely stuck (it means it is just not smooth and sometime may have tick noise because of glue). 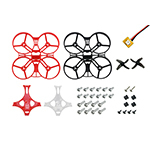 Connect the ESC and spin the motor between 10-50% throttle for 10-30 seconds (do not mount any propeller). Please never spin the motor at full (100%) throttle without a propeller because such high RPM would damage the motor bearings and shaft. My motor is noisy at high throttle. Why? This happens (at the time you can hear the noise) only if you spin the motor without mounting a propeller at high throttle. Spinning a motor without a propeller at high throttle is totally a misoperation because a motor bearing is incapable to handle such high RPM (speed). This misoperation might damage the bearing inside the motor and caused the motor overheat, noisy and shaking. A motor will never spin at such high RPM (speed) in real flight so to judge a motor is bad (factory defective) by doing this is a wrong method. Therefore, a free replacement or refund will not be gained by showing this because the noise will not appear after a proper size of propeller is mounted before spinning the motor. The larger propeller the slower RPM. So when a propeller is installed on the motor, the RPM of the motor will be much slower so you will not see motor ​twitching again. 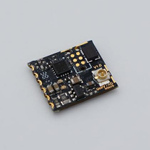 If you still seeing it ​twitching, then you need to purchase the latest high performance ESC with high speed MCU (eg. 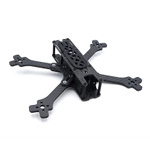 XRotor or BLHeli ESC which can work work with the high spec. KV motor (high RPM). Some people with less experience would claim the ESC had no problem when it was used with another motor with thousands of flight so they would say it is the problem of the motor. But it is totally wrong. This is not a problem of the Motor or ESC but combination (Between Motor / Prop / ESC / Battery). 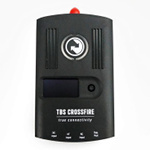 You need to get a new high performance ESC instead of using an old ESC with high Spec motor. Only use an old ESC with an old low Spec motor. Soft mounting on flight controller (the vibration could cause gyro on the FC unstable) to reduce vibration.